But as you know, snacks derail your diet like crazy. One minute you’re looking for a little treat to munch on and the next you’re elbow deep in a bag of chips and can’t button your pants. You need easy, healthy snack foods to enjoy NOW. You need snacks that don’t taste like diet food. I've got you covered! When you’re looking for nosh, whether it’s during TV time, game night or while you’re working at your desk, you need a solution stat. 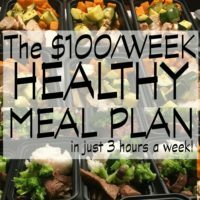 A few years ago, when we were first trying to cut back on our fast food to save money, we found having healthy snack foods available and accessible helped us stay on track. Cue: the snack fridge. We took an old, dorm-sized fridge my husband had and parked that bad boy right next to our couch. We filled it with healthy snack options. Whenever we were chilling out and hunger struck, we didn’t pick up the phone and dial out for pizza. We had our own healthy snack foods RIGHT THERE ON HAND. It was so easy, and it really made a huge difference. In fact, we both lost weight (and saved money). Even if you don’t have a fridge in your living room, set yourself up a snack shelf or area in your cupboard and fridge where you store your go-to snack items. Stock up on healthy snacks. Having them ready and easily accessible makes a huge difference. 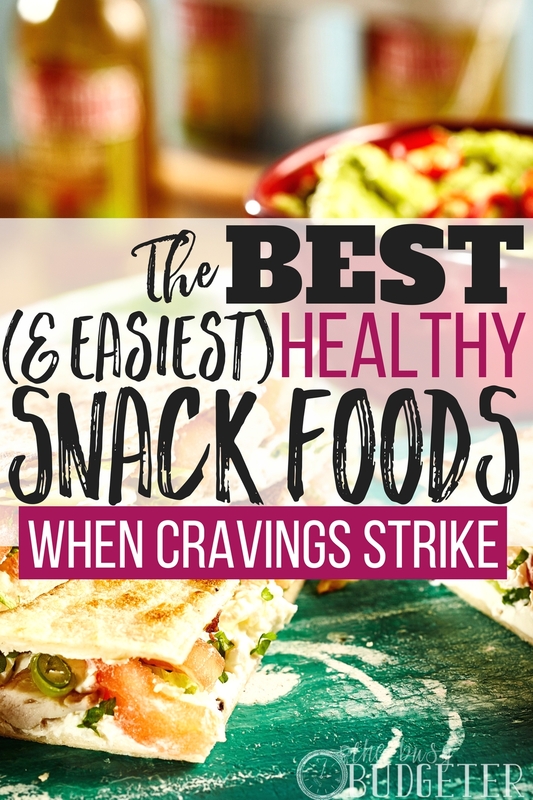 Whether you’re watching your weight, attempting to eat healthier or looking to save money by eating at home more often (and avoiding the call of fast food), stock up on these healthy snack food ideas so you always have munchies ready to go. Moms of school-aged kids struggle with the snack foods conundrum. What should you stock up on? What should you send in the lunchbox? More and more, schools realize kids focus and learn better when they enjoy snacks throughout the day. Hunger makes it tough to concentrate. The same is true for grownups. If you find you hit a wall around 10 am, you may need a snack—a mini-meal that will sustain you, not send you running to Starbucks for caffeine and sugar. Snack food options should offer a little bit of protein and a little bit of carbohydrates. Combine your snacks so they’re more filling. Pack a few snacks in your and your husband’s lunchboxes (as well as your kids') to keep everyone sustained throughout the day. Okay, admittedly, I’m a bit of a food safety nut. I really don’t like to risk it or play fast and loose with expiration dates. I also don’t like to leave items out of the fridge for too long. When you’re packing lunchboxes for the full day or heading out on a day of errands, you need snack foods that aren’t going to wilt if they’re out of the fridge for a few hours. Most dairy snacks are okay in a lunchbox with insulation for a few hours, but by afternoon food safety gets questionable. 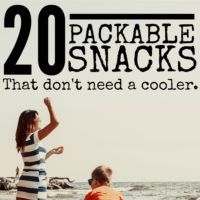 Pack cooler-free snacks to enjoy all day. 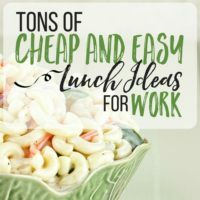 These are great snacks to keep in your car, in your bag or in a drawer of your office. So, what about when you’re at home? When you’ve got access to the kitchen you can get pretty serious about snacks. Of course, none of us wants to spend hours making “gourmet” snacks. When you’re hungry you need a solution to curb the munchies FAST & EASY. My go-to-snack foods used to be less-than-healthy options: cookies, ice cream, a brownie in a mug (okay, those are seriously good). When I’m focused on getting healthier though, I like to make healthy, easy snacks that take less than five minutes. These are so easy. All you do is freeze grapes for a day or two. They take a while to eat, they’re refreshing with no added sugar. I buy them, rinse them off (it helps them freeze better) and put them in a big freezer bag. Then I cut off a stem or two when I’m feeling snacky. If you love mozzarella sticks, try cutting up a cheese stick and dipping it in a little cup of marinara. Microwave the marinara to heat it up if you like or dip it cold. This is so easy and really satisfying. One of my favorite snack ideas. Take a graham cracker, spread it with cream cheese and top with strawberry or cherry jam. This tastes JUST like cheesecake for much fewer calories. 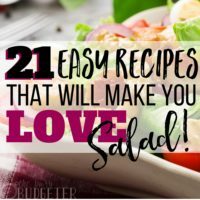 It’s so easy and super yummy. My kids love these too. This one doesn’t require much in the way of instructions, but dipping carrots in ranch dressing is about the easiest, simplest snack out there. Yet, it’s one of those go-to snacks that’s super satisfying (and healthy—you can even use light ranch)! Cut up summer sausage, ham, pepperoni or other meats, and enjoy them along with a few slices of cheese. This is a classic appetizer, but it’s also really simple to put together, high in protein and much healthier than eating pizza with the crust and extra cheese. Even if you’re not a fan of regular raw fish sushi, banana Nutella sushi is a concept we can all get on board with. These are perfect for a snack or even a light lunch. They pack easily and don’t need refrigeration (love that!). Plus, this is an extremely inexpensive recipe. Cheaper, healthier and easier than a Snickers bar! Want a way easier and healthier solution to your pizza craving? Well, these quesadillas are super simple, cheap (again, under $1 to make—beat that with a pizza slice) and yummy. 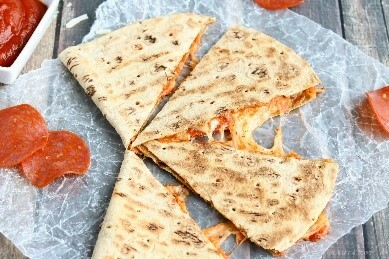 Keep tortillas on hand to whip up these simple satisfying pizza quesadillas in less than 5 minutes, which is faster than delivery! Okay, somedays you need chocolate. 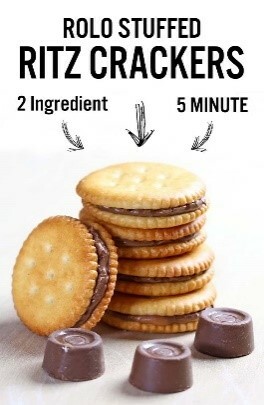 Here’s the deal—four little Rolos and Ritz crackers won’t blow your calorie budget, but these feel like a great treat! Plus, with two ingredients they are so easy to make. These corned beef roll ups satisfy any deli craving. 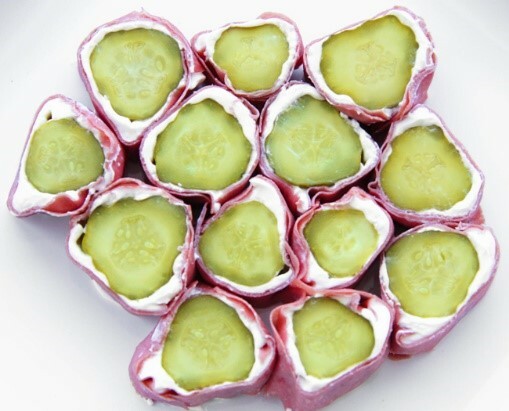 Pickles, cream cheese and corned beef are a perfect flavor combo. These are salty and savory and low carb, if you’re watching your bread and carb intake. Plus, they look great, and are perfect for a party too! Okay, who doesn’t love apple pie? This super simple recipe tastes like delicious, sweet and satisfying apple pie, but without ALL the extra calories. There’s a little sugar for sweetness, but not too much, and with the oats it hits all the notes of the real deal. Plan ahead, store some healthy snack foods in your bag and keep items on hand to whip up delicious and satisfying snacks in under 5 minutes. These are snacks the whole family will enjoy: kids AND husbands…and YOU! So, tell me, what are your favorite healthy snack foods? Do you have a quick “poor man’s” version of your favorite dessert that you whip up in a pinch? Hmmm snacks. lol Thanks for the ideas. I’ll try some of these. Great list! 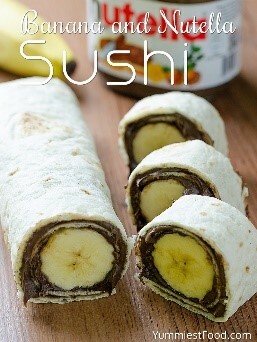 I gonna give the Banana and Nutella Sushi recipe a try as they look lovely. I like this article. I’ve tried the 2 Minute Microwave Cinnamon Apple Dessert and YUMMY! the taste of this dessert is simply AMAZING and it is so healthy! Thanks to that magical spice “Cinnamon” that tastes good in/on ANYTHING and this was no different plus it has been used medicinally around the world for thousands of years. My personal favourite is carrots with hummus, sometimes a spicy variety of hummus. I enjoy taking this to work and annoying co-workers with Bugs Bunny imitations.